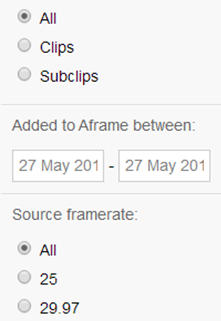 In-built into the Media section of Aframe are easy to use organise tools that enable the viewer to list clips in order, according to various set parameters. Now look to the right of the Media page, you will see tools to help organise how your media is presented. You can order how the clips are displayed, by choosing one of the drop down boxes or using the filter options. Order - lets you put the clips into different display orders, by making use of this drop-down, you can quickly make sense of large swathes of media. Collections - enables the user to jump to a specific selection of clips - be they auto-generated (ie cards) or compiled by a member of the project team. 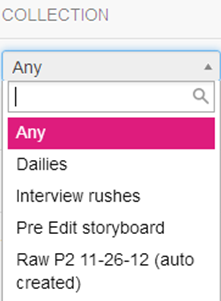 Filter - You can also search your project for clip titles, summaries, comments & markers. Use full words to filter rather than part. 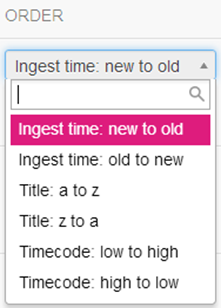 You can also drill down your search further by using the ‘&’ sign. The rest of the filter options let you drill down your selection further if you know the clips you are looking for are sub-clips, what date they were uploaded or even by frame rate. If you are a member of multiple projects and you want to find something but are not sure which project the media is on, then try the Global Search, as shown here, which will search across all of your projects.